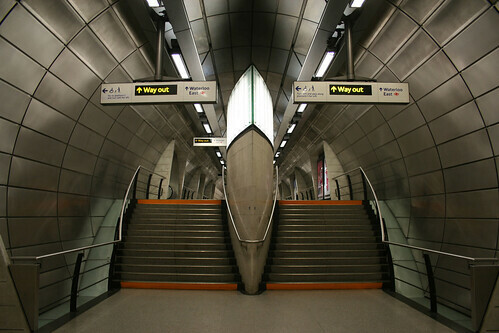 Of all the tube stations which were built for the Jubilee Line extension – my favourite has to be the little noticed one at Southwark. While I like Westminster and (obviously) Canary Wharf, there is something almost serene about Southwark, probably due in part to it being quieter than other stations – and the design of the station. Going in from the street level, there is a fairly generic entrance and set of escalators down to a middle level – and it is here that people should stop and admire the view. This high space with a blue glass wall to one side and a high concrete wall marked with three tiny holes in the wall looks more like a modern day church than a tube station. According to the station’s architect Richard MacCormac, the design of this and the lower level concourse were inspired by the designs of the 19th century Prussian architect Karl Friedrich Schinkel. It is a quite wonderful space which seems to be little noticed by people rushing through. Along the wall are three tiny “mouse holes” in the wall, and these lead to very narrow tubes with escalators leading down to a lower level which is starting to look more tube-like. 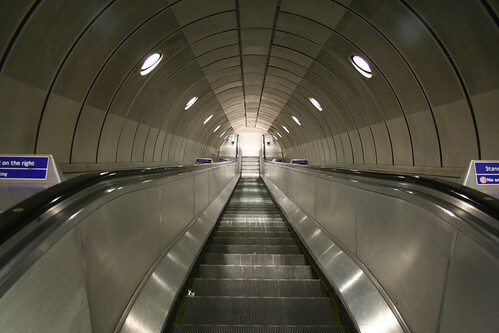 Then a flight of stairs to each end take you finally down to the level of the tube trains. I think this is a really quite under-rated station – and well worth stopping at one day, as it is only a short walk to Waterloo if that is where you were aiming for originally.